A beautifully designed, inviting interactive journal to help you destress, reduce anxiety, and find peace from the founder of the popular online community Tiny Buddha, and author of Tiny Buddha’s 365 Tiny Love Challenges and Tiny Buddha’s Gratitude Journal. "Color and Draw Yourself Calm"—fifteen coloring pages and fifteen doodle pages carefully designed to inspire you to use your own creativity to soothe worries and focus on the moment. Don’t let anxiety control you. 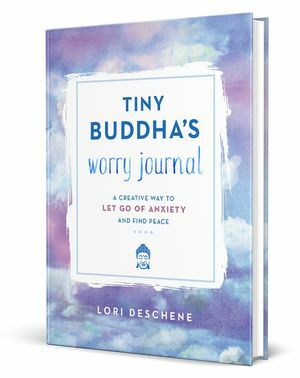 Tiny Buddha’s Worry Journal lets you carve a little time for yourself every day, and gives you tools to help you improve your mood, focus on the present moment, and kindle your unique creativity.